Beef Kebabs, Vegetable Kebabs, Minted Yogurt Sauce, Thyme for Cooking. These are best if prepared earlier in the day and allowed to soak up the flavors - plus it makes dinner a breeze! By doing the meat and some of the vegetables separately you can cook the skewers for different times: allowing the onion to get done to your liking without overcooking the beef. Put wooden skewers in water to soak. 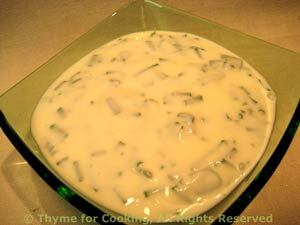 In small bowl whisk together all ingredients for marinade. Pour over meat and let marinate for 20 - 30 minutes, or longer. Clean mushrooms, removing stems. Add to marinade. Cut each half pepper into 1 1/2 " (3.75cm) squares. Cut zucchini into slices about 1/2 inch (1.25cm) thick. At this point you can set it all aside while the meat marinates, or assemble the skewers and allow to marinate on the skewers. Remove meat and mushrooms from marinade. Put onions, zucchini and peppers in the marinade and stir to coat. Thread meat, tomatoes and mushrooms onto half of the skewers, alternating. 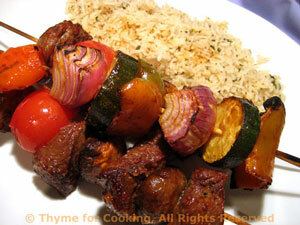 Remove vegetables from marinade and thread onions, peppers and zucchini on the remaining skewers, alternating. Add beef skewers over direct heat. Cook for 6 - 10 minutes, or until beef is done to your liking, turning halfway through cooking time. Remove and serve with Basmati Rice or Couscous. Could also be cooked under the broiler (grill) for 12 - 15 minutes, or until done. Mix well and refrigerate until ready to use. Serve with kebabs.